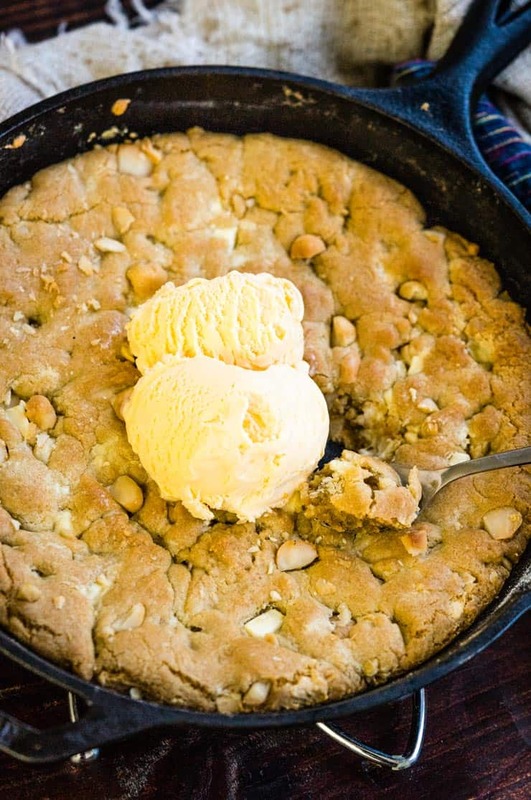 This White Chocolate Chip Macadamia Nut Pizookie has all the flavor of the classic cookie wrapped up in an easy-to-make skillet cookie that is just slightly underbaked and perfect to share with a scoop of vanilla ice cream! It’s no secret that I love myself a good pizookie! I recently shared a recipe and made a video for a chocolate chunk pizookie, and I’ve even made a microwave version of it, too! So, I decided to keep the Pizookie love going by sharing this white chocolate chip macadamia version with you today. A pizookie is basically a giant, ever-so-slightly underbaked cookie cooked in a skillet or pizza pan <— hence the name Piz-ookie. Pizza + Cookie. 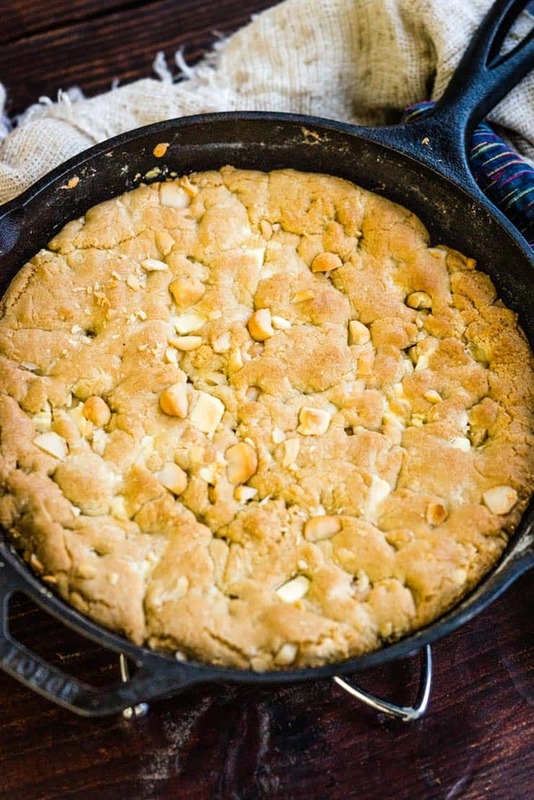 How Do You Serve A White Chocolate Macadamia Nut Pizookie? 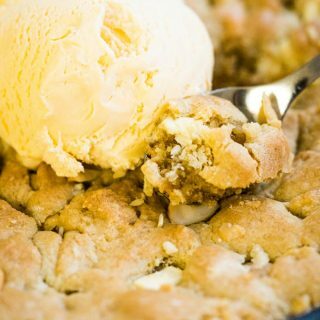 This White Chocolate Chip Macadamia Nut Pizookie is best served with a few scoops of ice cream plopped right on the top when still warm and eaten straight out of the pan. 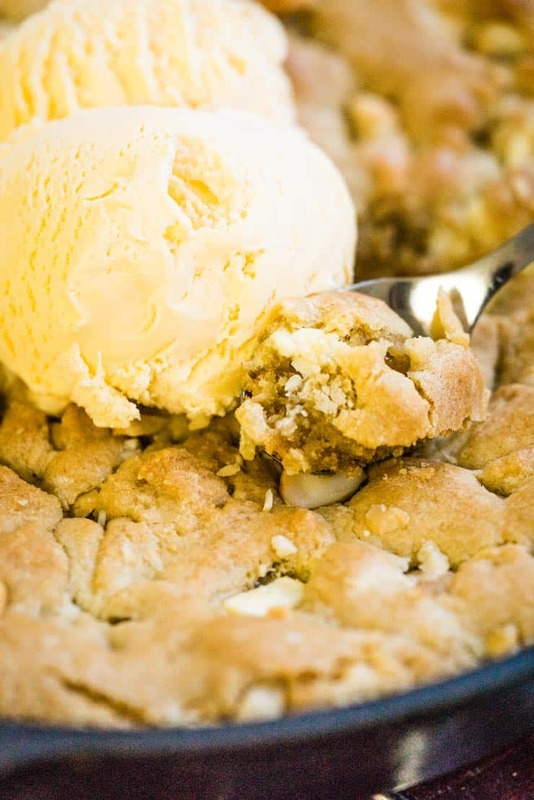 My recipe makes one, ten-inch pizookie so you’ll definitely need to find some help eating it! When making it for my family, I scoop up individual portions of it on a plate and add the ice cream then. But I’ll admit, it’s super fun to just eat out of the pan for date night! Start with a 10″ cast iron skillet. You can use a regular 10″ skillet, but the cast iron makes the crust extra crisp and enhances the whole experience. This is the one I have — it is inexpensive and will last you a lifetime if taken care of! Preheat your oven and set the skillet on the stovetop over medium-low heat. Add the butter to the pan, melt it completely and stir in the brown and white sugars and vanilla extract until combined. Remove the pan from the heat. At this point, you want to let the pan cool off for about five minutes to let it cool down enough so that the warm butter and sugar mixture doesn’t cook the egg when added. When cool, stir in the egg and use a fork to whisk it in. Add flour, salt, and baking soda to the pan and stir it carefully with a spatula until it is well combined and looks like cookie dough! Now it’s time to add the white chocolate chips and macadamia nuts! Stir them in until they are evenly distributed and lightly tap and form the cookie dough into the pan so that it’s even in the pan. Bake in the oven for about 15-25 minutes or until golden brown on top, and still a little soft in the center. Serve warm and vanilla ice cream! If you have some white chocolate chip macadamia nut pizookie left over and want to enjoy it warm again, just cover the pan with foil and pop into a 375-degree oven for a few minutes. It won’t take very long to heat it and will be toasty and warm, ready to devour again! What Kind of White Chocolate Should I Use? I prefer to use chopped white chocolate bar instead of white chocolate chips in this recipe. I feel the bars melt better and the variation of size between the pieces of chocolate really adds to the pizookie. You can find white chocolate bars like this in the baking aisle near the other baking chocolate. This pizookie takes all the flavor of the classic white chocolate macadamia nut cookie and turns it into a gooey, warm pizookie with a crisp crust and soft interior. Stir in white chocolate chunks and macadamia nuts. Place in the oven for 15-25 minutes or until golden around the edges and still soft in the middle.